Help save nearly 200 trees from an ivy infestation! Join us from 10 am to 1 pm on Nov 9th. 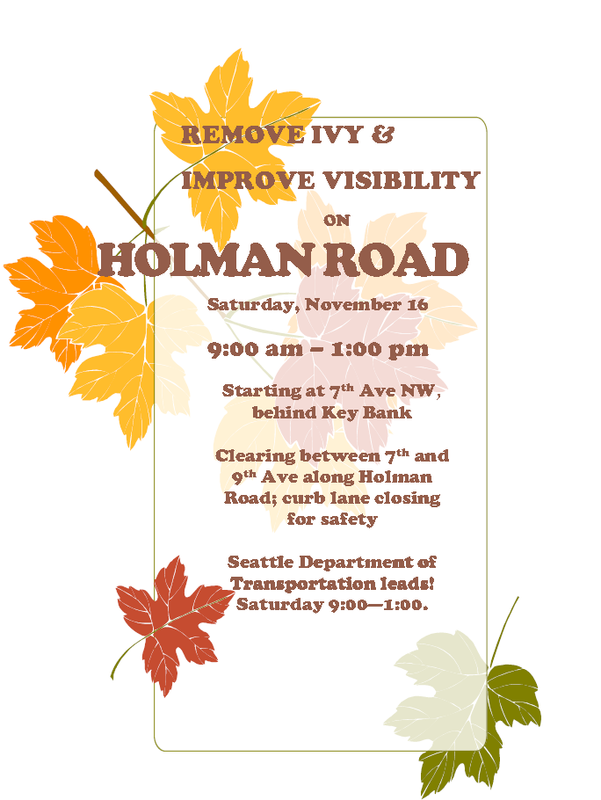 Help Crown Hill Business Association and our neighbors, as well as a safety and technical team from SDOT to save our street trees along Holman road. There will be a partial road closure of the curbside southbound lane for worker safety. SDOT staff will be working alongside us! Many tools and gloves provided. Bring shovels and loppers and if you prefer your work gloves, bring those too. Meet behind the Key Bank on Holman Rd. Work will proceed from 7th Ave NW toward 13th Ave NW. There will be food and beverages. Come for as long as you can. Let’s get this project started! Join neighbors and friends the 4th Saturday of every month as we remove invasive plants from the North Beach Park and Nature Area, at 24th Ave. NW and NW 90th St. We meet at 9 am at the entrance to the park; the next work party is August 27th. Bring water, sturdy shoes, and clothes you’re willing to get dirty. We’ll provide gloves and tools. North Beach Park is a small ravine park kitty corner from North Beach Elementary. Although there is a serious problem with invasives, the canopy and understory still have a diversity of native species, from Western Red Cedar and Big Leaf Maple down to Pacific Waterleaf. The park is also home to mountain beavers and numerous birds. Removing invasive plants increases the beauty and improves habitat and health of the park. For further information, please contact North Beach Park forest steward Luke McGuff at 206-715-9135 or lukemcguff@yahoo.com. Help with various projects around the center and grounds. We’ll adapt to the weather conditions. See you there! This past spring, the Crown Hill team has been hard at work on a number of improvements to the Crown Hill Center building and grounds. In that effort, we submitted a Department of Neighborhoods Large Project Fund to go towards replacing about 1/2 of the old roof surface. We are pleased to announce that the Ballard as well as City Wide Review teams have recommended this project for the maximum grant amount of $100,000! Thank you! The recommendation still must be approved by the Seattle City Council and the Mayor. We are hopeful that history will repeat itself and the review team recommendations will be approved as submitted. We are moving forward with several of the projects involved in the matching for this grant. The first work party, is Saturday, June 18th from 10-2. Stop by for an hour or four and help out. Rain or shine, we’ll be tackling projects that make the building a better community space. Weeding, clearing, grading, cleaning, scrubbing, picking up trash, organizing, and maybe even some painting. Spreading wood chips around the oak tree at 13th and 95th. This project effort is ongoing and was started by Doug Gresham and several other volunteers.